Don't be amazed to see bottle gourd pudding here. I know you must be checking the title again and scrolling down wondering how it looks like! 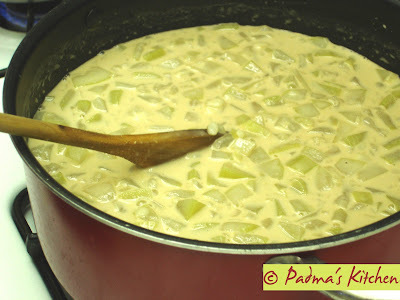 Yes indeed it is a sorakaya payasam or bottle gourd pudding! even I was zapped when I first heard it from my husband. If you have a sweet tooth then you gonna enjoy this recipe. My MIL taught me this traditional, authentic payasam on her recent visit and you know there is no milk in it! Isn't that wonderful..... payasam without milk! OMG! Yet another sweet savoury for JFI-Rice hosted by Sharmi of Neivedyam. 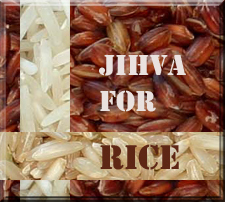 Jihva for ingredients (JFI) is the brain child of Indira of Mahanandi. There are recipes that call for milk and sugar and can be find on internet. 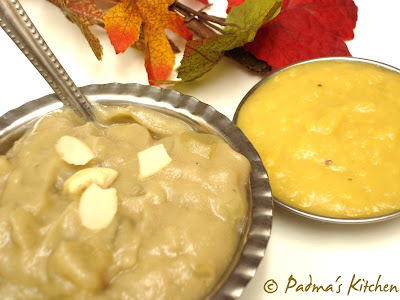 but this payasam is made out of rice, jaggery and bottlegourd and is served with cooked dal(side dish) and a dash of ghee/clarified butter. What a great treat for those chilly winterly-fall evenings. I am sure you will give it a try and let me know how this tasted in your kitchen. Wash and soak the rice night before. Grind it first without water and then start grinding by adding 1/4 cup of water at a time. The batter should not contain any coarse rice (rice rava), grind it more to attain a smooth texture by adding little more water, you can see the photo here. The batter should be little thin just like dosa batter. 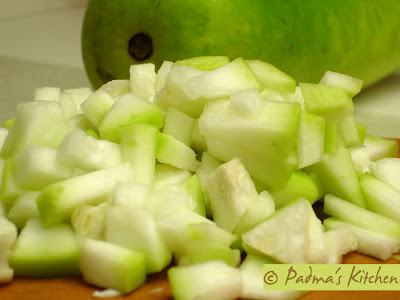 Peel the bottle gourd/sorakaya and cut them into small bite size pieces like in the picture. Pressure cook them in 1/2 cup of water, sugar and salt for 3 whistles (depends on cooker). To be more specific the gourd should not be over cooked or mushy, it should retain its shape. 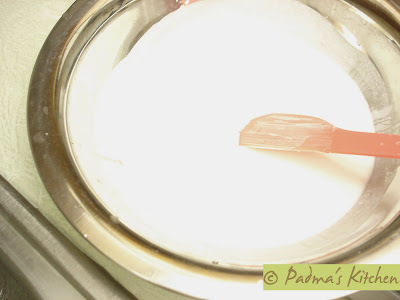 Once cool transfer the content to a large deep pan dont throw away the water, turn on the heat. Meanwhile boil some dal and add salt once its cooked. In a large bowl mix the grated jaggery into the rice batter, add cardamom powder and mix well till jaggery/gud/bellam is mixed properly. You will notice the color changes from pure white to light brown color. This color also depends on the type of jaggery used, if it is old one like the one I used in this recipe, it will be little darker. Check the sweet levels, if its mild then stir little more jaggery or as per your taste. 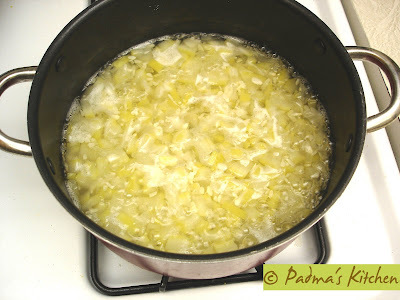 Add this mixture to the bottle gourd/sorakaya pieces and cook on medium low while constantly stirring it. You will know when the rice in the batter mix is cooked, as the payasam will turn thicker. Once its cooked turn off the heat, garnish with your favourite nuts and serve hot with a dash of ghee/clarified butter and cooked dal. This indeed is an usual kheer! And served with cooked dal? Very interesting! The kheer looks so creamy and smooth! Awesome recipe, Padma. You have such beautiful pictures too. I have heard sorakai halwa but not payasam. nice recipe and looks yummmm. Very interesting - I've heard of sorakaya payasam and halwa, never this! creamy... have eaten sorakkai halwa... this is new. Looks beautiful. Looks great. I've only eaten the halwa before. Absolutely new to me...cant even imagine the taste!! Rajitha, try it and lmk how this came out! Dear Sra, Raaga, Happy cook and TBC hope you liked this recipe! Cynthia and Mishmash, well said! sorakai, rice and payasam? all in one? :) one of the most unique recipes i have seen! lovely..
A very unusual payasam, Padma! 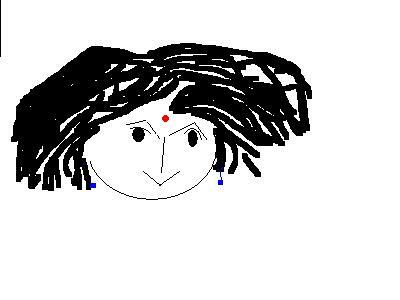 Hi, Padma. I'm in Malaysia at the moment, enjoying Chinese, Malay and Indian cuisine. Had wonderful North Indian dishes one night with a few good friends. I love palak paneer. Yours is a lovely dessert featured here. 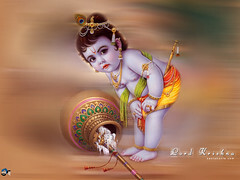 Good to read about your religious and cultural practices in one of your previous posts. Did u purchase the software..? wow never heard of this dish.Sure be tasty!!! this is a very different recipe. I would love to try out sometime. Wow, that sure is a unique recipe for payasam... I am not a big bottle gourd fan, but this sure will be a great way to use it! very unique recipe! i have heard of bottle gourd milk payasam, but this is different. will certainly give it a try. never thought of bottle gourd in a payasam. payasam without milk? with jaggery? i'm gonna love love love this. Nags tx for visiting my blog, glad you liked this unusual recipe from my MIL..
Sirisha Kilambi, sure would like to taste ufff look at your version.. Thanks for sharing such an unusual recipe. This payasam is new to me. Will try this soon and let you know. Thanks for sharing. Looks like a great payasam...love jaggery sweetened paysam's. Thanks for coming by...you have a wonderful blog here with yummy dishes. That's very interesting Padma. 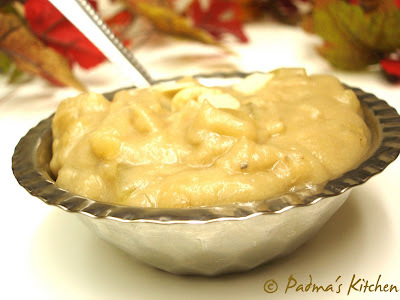 Recently I also went out of the norm and prepared beerakaya payasam, it tasted very good. Now I'm going to try this one also.